According to statistics published by the Energy Information Administration, crude oil output averaged 413,300 barrels per day in 2005. Following a minor discovery in 1982 in the south, an American company found an oil basin near Marib in 1984. A total (170,000 barrels) of oil per day were produced there in 1995. A small oil refinery began operations near Marib in 1986. A Soviet discovery in the southern governorate of Shabwah has proven only marginally successful even when taken over by a different group. 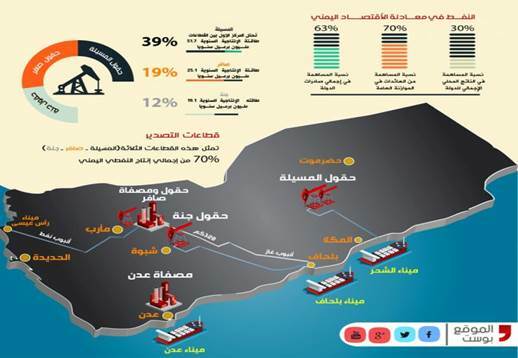 A Western consortium began exporting oil from Masila in the Hadramut in 1993, and production there reached (420,000 barrels) per day in 1999. More than a dozen other companies have been unsuccessful in finding commercial quantities of oil. There are new finds in the Jannah (formerly known as the Joint Oil Exploration Area) and east Shabwah blocks. 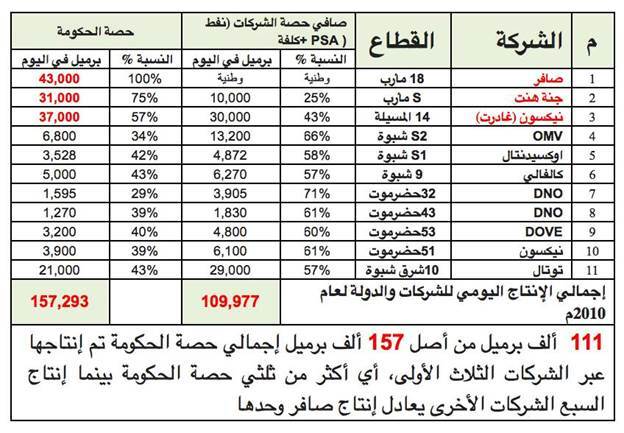 Yemen's oil exports in 1995 earned about US$1 billion. Marib oil contains associated natural gas. In September 1995, the Yemeni Government signed an agreement that designated Total of France to be the lead company for a project for the export of liquefied natural gas (LNG). In 1997, Yemen Gas Company joined with various privately held companies to establish Yemen LNG (YLNG). In August 2005 the government gave final approval to three LNG supply agreements, enabling YLNG to award a US$2 billion contract to an international consortium to build the country's first liquefaction plant at Balhaf on the Arabian Sea coast. The project is a $3.7 billion investment over 25 years, producing approximately 6.7 million tons of LNG annually, with shipments likely to go to the United States and South Korea. Production of LNG began in October 2009. The Yemen government expects the LNG project to add US$350 million to its budget and enable it to develop a petrochemicals industry.